Few people are visionaries. And even fewer succeed in turning their vision into reality. Megan Moon is one of those rare people. As the founder and President of the Humane Education Coalition, Megan and her organization are literally changing the way we think about humane education. In less than a year, this global alliance has attracted 80 partners in 22 countries. She’s quick to give credit to the more than 50 advisors and board members who help her, but Megan is one to do her homework. As with so many others we’ve profiled, Megan wanted to help animals for as long as she can remember and worked for several non-profits after college. Each organization faced different challenges, but the common thread among all was a lack of resources. As she continued studying humane education in graduate school, the problem was acute, as funding was limited and competitive. The solution, in her mind, was collaboration. The Coalition initially embarked on a global feasibility study and then created a broad and holistic alliance. 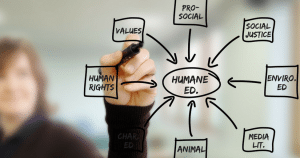 While humane education was originally rooted in a kindness toward animals ethic, it has evolved to include the environment, as well as human rights and social justice, and the Coalition has embraced these diverse, yet complimentary, partners. No issue is given preference or dominance and partners are both selectively chosen and required to adhere to clear guidelines, which, as Megan notes, fosters a “mutual respect that is unparalleled.” It is a refreshing concept in a world where non-profits often feel compelled, out of necessity, to operate in silos. Even more remarkable, humane educators can access the Coalition’s vast materials for free. The website is a 1-stop site containing a resource toolkit with links to 330 resources and lesson plans from partner organizations (90% of which are available at no cost), and the Coalition seeks to create its own Toolkit with lesson plans in the future. 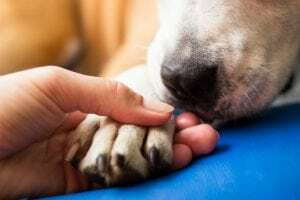 In addition, it has launched a podcast series with experts and is also hosting a 3-day online Humane Summit on February 5-7, 2019, which will feature several speakers per day, along with more casual sessions, where participants can interact and ask questions of experts. The Coalition plans to launch a “Tips and Tools of the Trade” video series, as well as The International Journal of Humane Education, a peer-reviewed, online academic journal – the first of its kind worldwide – to raise the bar for the field. 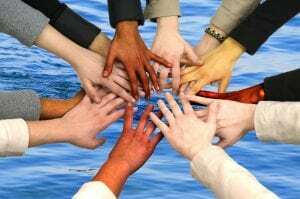 The Coalition seeks to empower partner organizations by providing consultants, free of charge, as many are emerging non-profits as well. These consultants can give advice on common issues, such as how to recruit volunteers, advocate effectively, and become self-sustaining. 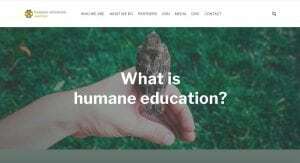 In addition, the Coalition will provide grant funding with priority given initially to organizations that develop assessment tools and metrics to gauge the efficacy of humane education programs, which is solely lacking. This priority is necessitated by our data-driven world, as humane educators cannot plead their case without the research to support it. While 18 states already mandate some type of humane education in their curricula, Megan is working with the Graduate School of Social Work at the University of Denver (which we profiled last month), to conduct an in-depth assessment of humane education in the United States. Ultimately, they seek to publish, “Making the Case for Humane Education,” a white paper that will contain a comprehensive template that teachers can present to policy makers in the majority of states that have not implemented humane education programs. With daily assaults on animals, the environment and human rights, there may be no better time in history for humane education. Yet, it’s been a demoralizing field for those in the trenches, given mandated school standards and education requirements that not only differ in each state, but even county-to-county. Admittedly, it’s a field that has never gotten the respect it deserves, because there are no standards. 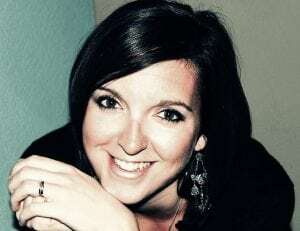 Megan seeks to motivate and inspire, by ultimately creating a humane education accreditation, which will provide more credibility for humane educators who seek to implement these programs. The Coalition will also bestow Excellence Awards to those who make significant contributions to the field. Megan Moon is a person who not only thinks outside box, but around barriers that countless others have deemed insurmountable. She has the courage of her convictions, as well as the talent and determination to execute her ideas. Megan and the Humane Education Coalition have sounded a call to humane educators and shelter professionals worldwide, as well as to anyone else who dreams of a more compassionate, just and sustainable world. We’ve joined her and hope you will too. To access materials, podcasts, lesson plans and trainings, visit the Humane Education Coalition at www.hecoalition.org or visit their page on Facebook or Twitter.